Before Maverick and Mean Streak dominated Frontiertown, White Water Landing ruled the majority of the real estate in the area. 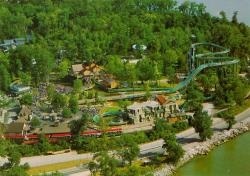 When it was debuted in 1982, White Water Landing was one of only two water rides that operated at Cedar Point, with Mill Race being its older counterpart. The ride consisted of an about five-minute journey around and over the trees of Frontiertown. The ride took passengers up 45 feet in the air, and wound around in the air. Once you had finished your journey in the air, you plunged to the ground at a forty degree angle in a fiberglass canoe. The ride held an Appalachian riverside theme, which fit in well with the theme of Frontiertown and the Frontier Trail. The ride originally ran with a dual-flumed drop, but after an accident in 2002, White Water Landing only ran with one flume open for the last few years of its operation. This was the only accident in the ride's history, when two of the ride's canoes collided at the bottom of the ride's twin chute drop, where the two flumes meet back up as one. After the two canoes collide, they became lodged at the end of the flume, and as the next canoe came down, it rammed the other two. In all, six people were minorly injured, and were all treated at a local hopsital. They all were released shortly after.